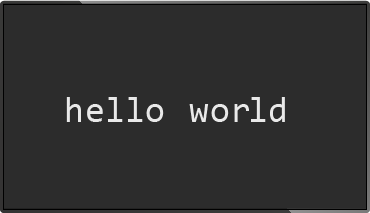 info-beamer allows you to rapidly prototype interactive multimedia presentations on Desktop Linux using the Lua programming language. A directory (called a node) consists of resource files (images, videos, fonts or shaders) and a control script called node.lua. Learn more in the documentation. Want to use your visualizations on the Raspberry Pi? You can do that too: Just run them on the Pi using info-beamer pi. See the documentation to learn more. Or take a look at more code examples on github. Edit the code for your node, change images or exchange font files. info-beamer will notice your changes and reload changed files. See the effects of your changes immediately. info-beamer uses the linux inotify API to detect changed files or directories. You never have to restart info-beamer to see changes you made. info-beamer can reload updated files for you. Update the running code in realtime. There is no need to restart info-beamer. Lua is a simple language. If you have basic programming experience, you'll learn Lua in a few hours. Load images and truetype (TTF) fonts. Video playback is supported using the powerful libav library. Image loading is provided by DevIL. Video playback is powered by libav. It should play most video files you might have. Use Shaders in the GLSL language. Full Truetype font support using freetype. info-beamer uses OpenGL and will use hardware acceleration. Full shader support using GLSL. Load vertex and fragment shaders. Control your shaders with dynamic uniform values. Feed your shaders with textures from images, videos, child nodes or even VNC connections. Each directory forms a node. A node is the unit of presentation for info-beamer. If a directory contains subdirectories, these create child nodes. Child nodes can be rendered by parent nodes. Allows you to create a toplevel node that switches between child nodes. Nodes can be developed independently and later composed into one presentation. Include remote content using the VNC client. Send OSC (open sound control) packets to info-beamer. Update the state of your presentation in realtime. Or use TCP to connect to info-beamer to see the debugging output of your running code. Simple UDP protocol and OSC protocol support. Let info-beamer display a directory shared using Dropbox. Since info-beamer will detect any changes to the directory, this will allow you to update your presentation from remote. info-beamer is opensource software release under the BSD 2-clause license. Use and modify the software as you like. info-beamer also runs on the Raspberry Pi micro computer. Easily deploy your visualizations on those tiny machines. Setting up a Digital Signage display won't get easier. No need to by overpriced special hardware! Using the new fully managed service you can now control your info-beamer based visualizations easier than ever. Install prepared visualizations with the click of a button on your devices. Upload assets like images and videos and have them distributed instantly. Change settings using a web based interface. Running info-beamer code won't get easier than that!